For the past 10 years I’ve been on a mission to share the vision I believe God put into my heart for a church-based “Bible reading revival.” I’m convinced that the simple practice of meeting God every day in the Bible and prayer is not just a commendable spiritual discipline. It’s also the key to the renewal of the church itself. That’s also why Scripture Union developed the E100® Bible Reading Challenge. It’s easy-to-implement program that helps entire churches read 50 Old Testament and 50 New Testament passages together, and it really works. 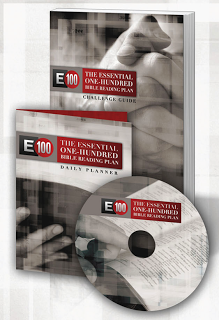 Scripture Union has an E100® Pastor’s Kit that explains all the details and includes a live samples of all E100® resources. If you’re a pastor, minister or priest, and you are interested in E100® for your church, just call our office (1-610-935-2807 x401) or email us ([email protected]) and we’d be happy to send you a Kit…FREE. I look forward to hearing from you…soon. Thank for the post.I like music.